These beauties were found over at 101 Cookbooks. They're really tasty - great for a snack before dinner. I served them very simply with a Vasterbottens Cheesey Butter - just grate cheese (Vasterbottensost is sort of like a young Parmesan, so you could certainly substitute that, or a Pecorino, or why not a Gruyère?) and mix it with softened butter. Simple, and really delicious. 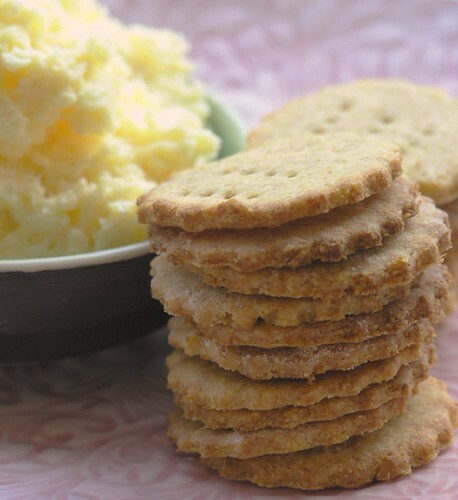 I made the crackers with spelt flour, and that was very nice. Use regular wholewheat or normal white flour if you wish. Heat the oven to about 175°C. Divide the dough into quarters, and roll out one piece at a time. It should be rather thin, so be gentle. Use a cookie cutter to make the crackers, and place them on a lined baking sheet. Keep going until all the dough is used up. Bake the crackers for 8-10 minutes - it might need longer if yours are thick, but mine were definitely done.They burn easily - so watch them. Let them cool completely, then serve or store in airtight jars. The crackers can easily be refreshed by a minute in a warm oven, if you want to make them in advance. Hi, we came across your blog for the first time through random search and we found that your blog is very attractive and useful. We'll be trying out some of your recipes soon. And also checking out your blog regularly! There has to be a special place in food heaven for a woman who bakes her own crackers! I love your blog. You have beautiful recipes and inspiring photos here. Nice work. Interesting idea to mix cheese with butter! I have a olive oil, rosemary bread that I like to serve and that spread sounds like it would go well. I'll give it a try! I am now very, very hungry. Beautiful site! Made me want to cook. My first blog site visited--sounded interesting. Gave me good ideas for my site which is brand new and boring in comparison--check it out, I'm gathering stories on small, simple things that make a difference in people's lives. Cheese and polenta are so good together, I bet these cookies are hard to resist! Oh wow, those sound totally fabulous! And I particularly like the sound of the cheesy butter. Mmmm!